Filed under entertainment on October 25, 2012. …lift me now so I can fly.” Do you remember which 70s super-powered hero uttered this phrase to take flight? No? Then see if this one refreshes your memory, “Oh mighty Isis!” That’s right, a couple of years before Lynda Carter’s Wonder Woman hit the airwaves, there was another female superhero protecting teens and southern California from evil and personal injury. Her name was Isis and after the link below, I take some time to reminisce about those early Saturday mornings shows. That, “Oh my,” is both good and bad. The good is that the series is just as I remember it as a child. 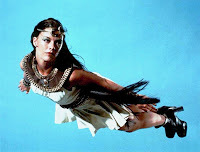 JoAnna Cameron, in a dual role as Isis and Andrea Thomas (Chemistry Teacher for a southern California high school), does a great job channeling the mythical superhero. The bad is that she has to deal with 70s special effects technology, simple scripts, and horrible acting by her co-stars. The horrible acting does have a plus side – lots of humor for today’s viewers. Take for example a situation where a teen walks past a sign that says, “Danger, hidden mine shaft.” Bet you can’t guess what happens next! And when it does, the facial reaction of the actress falling down the shaft is priceless. Check out the episode entitled, Year of the Dragon for this laugh. Before you ask, there’s no Kung-Fu in this episode. That would be far too violent for Saturday morning television in the 70s. Although Isis is a mixed bag, there is some real nostalgia here and I found myself enjoying my trip back to the 70s. There are episodes including crossovers from Captain Marvel (you know, the boy who turns into a superhero by uttering the word, Shazam!) and the show really does get better with each episode, if only slightly. The last two episodes of season 2 and the series, Now You See It… and …Now You Don’t, really are the pinnacle of the show and demonstrate what this show could have become with a couple of more seasons and a bigger budget. It was not to be. For some unknown reason, Isis only received two seasons and three guest shots on its sister show Shazam! Even though the popularly of the show and the character was growing. Isis does have a legacy though. 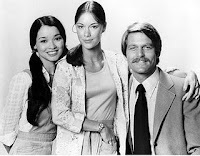 Fans all over the web reminisce about the show, the actress and its weekly moral story (as was evident during my research for this post). A decade later, Isis appeared in a cartoon called the Space Sentinels. She eventually made her way to DC Comics universe alongside her television co-hero Captain Marvel, now called Shazam. She later appeared in a somewhat modified version of herself in a season 10 episode of Smallville. Too bad JoAnna Cameron was not asked back for a cameo. So what are you waiting for? Grab that remote to your Netflix enabled device and get to adding The Secrets of Isis to your instant queue. After watching a few episodes, stop back by and let me know what you thought? Did it bring back memories, a smile or a laugh? Keeper of the winds swirling o’er, smoke those robbers out the door.